The designer of the clipper ship Cutty Sark. 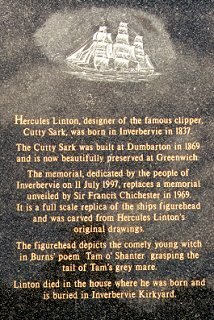 Linton was born in Inverbervie (Aberdeenshire), the son of a carpenter, and began his career in the shipyards of Aberdeen. He was a partner in the firm of Scott & Linton at Dumbarton and it was there that the Cutty Sark was built, which is now preserved at Greenwich. Linton spent his final years in the house in which he was born, serving as a councillor in Inverbervie for a time, and is buried at Inverbervie Kirkyard.